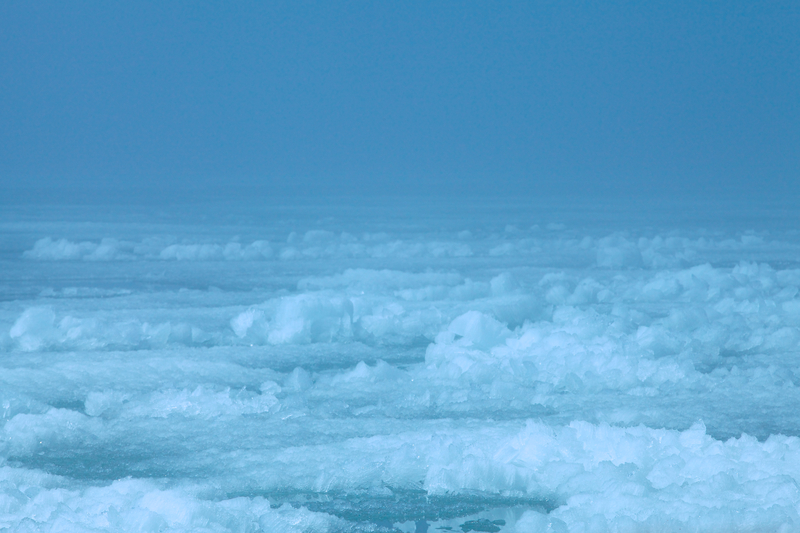 The ice on the sea water disappears into the fog. It’s a tough place to survive. There’s a unique and dangerous sea creature that prowls the waters of the Arctic. Few have ever heard of it. Photographying the extremely rare and endangered whalloon is an experience few have enjoyed. I had the incredible opportunity to go to the far north and search for this elusive creature. With ice foes in the background, the whaloon surfaces briefly (taken though the porthole on our ship). The eight-foot-long predator is ideally suited for a harsh environment. It has a layer of fat and slow metabolism that allow it to live in an ecosystem where ice and freezing temperatures are all too common. Few humans ever venture where the whalloon plies the deep waters. But I was game! The obvious problem with trying to spot whales of any kind is that they hide under the water. With just seconds required to get air before diving again, the opportunities of seeing anything is limited. Thankfully the whalloon has a patterned camouflaged back which, ironically, makes it easier to see on the water. I nearly froze after days of getting whipped around by the wind as our captain skillfully manoeuvred around giant ice floes. Just when hope was receding, I spotted a whalloon. With frozen fingers I tripped the shutter and cracked a smile through frosty lips. I got what I came to see! OK that may not be exactly what happened. A few days ago, I drove a couple hours north and was completely surprised to find ice still on the lake. While photographing loons, I had to chuckle that they appeared headless when starting their dive. Somehow it reminded me of whales and the rare whalloon was born. A story about finding a whallon seemed much more fun than explaining how I missed another shot. This whalloon dived close to our ship. Dear Lyle , I have been away for a long time.I ust have missed a lot of your beautiful pictures. I am in the process of catching up. You seem to have travelled away from land to the sea.This is the first pictures of a whallom i am seeing. I am unable to visualise them fully like their other larger family members. Let me settle down again and try to recover myself. Regards, Ganesh. I was thinking the other day I haven’t heard from you from some time. Welcome back. I must confess to having a little fun with this post. The photos are actually of a common loon that is starting a dive so the head is under water. You can see complete pictures of the loon here https://krahnpix.com/2014/06/01/underestimated-again/. You’re a tricky one, Lyle! Thanks for the cooling trip, though. Temps over 100F here today! At 100 you need all the real and virtual cooling you can get! I really enjoyed seeing this strange new species and the ice fog is very cool. Actually, probably even cold. The whalloon is now documented and its legacy secure! Actually the cool freeze carrying the fog off the lake was a nice feeling on a warm day though you’d never know it by the photos! Ha! I believed every word – never mind being taken in “for a moment!” I was even thinking that the whalloon was called that because of that loon-like coloring, and feeling kind of proud that I’d figured that out. Jeez. I may have just created a monster. You’re never going to believe anything on this blog anymore. Hmm. Should have thot of that sooner! Now, is that a killer whalloon or the humpback whalloon? Let me see. I think I like the sound of killer whalloon better so I’ll go with option 1. Yes I like that one. Wow looks freezing! You got us too! The strange thing was that the days I was there were quite warm and it was pleasant to have the cool breeze coming off the ice. Thanks for reading along. Good point. I probably should have done it then. You had me going for a bit. Nice shots of the loons. It didn’t take much to get your creative juices going. Are you a fisherman? I think I know now how a fish feels when it takes the bait that is dangled right in front of it. The ice over most of the lake worked in my favour since the loons were in the open water near the shore. I have a few more loon shots that will surface in the coming weeks – and they will have heads. The beautiful location where I was would spur most people’s creative juices. Glad you liked the loons. I have a strange attraction to the last one that I can’t explain. As for fishing, I have tried it a number of times over the years but it never really did anything for me. Your fishing metaphor does raise an interesting point. Remaining readers will approach future posts with a great deal more cynicism. The same bait will never work again. Very funny, You certainly had me going and totally believing your story. Just start following, so am looking forward to many more ‘stories’. Now you’re putting the pressure on! Where do I find more stories? It’s always nice to find people who share the same sense of humour. Thanks for coming along for the ride. Haha…what a great imagination you have…you really had me believing for a moment there! Love your story and your images! It seemed so surreal with the ice and the loons it spurred the imagination to strange places. I’m happy you enjoyed the post. Looks too cold for the likes of me, but the chuckle warmed me up! It was surprisingly warm when I was there which made the ice seem completely out of place. Enjoyed your story and loon photo! Glad to hear. Had to have a little fun with it. Wow, you had me completely tricked!! I was shocked I’d never heard of this creature on Animal Planet or the Discovery Channel before…ha. Good one! I keep discovering new animals from watching those shows so I thot it was worth a shot. Glad you enjoyed it. Glad you found it funny. Not to worry, the temperature actually rose to 29C (84F) which was rather odd given the ice on the lake. What kind of a blogger would intentionally try to lead people astray? Wait a minute that was me. Thanks for playing.